After an hour or so, the first group came back, and it was now our turn to go into the dark jungle. 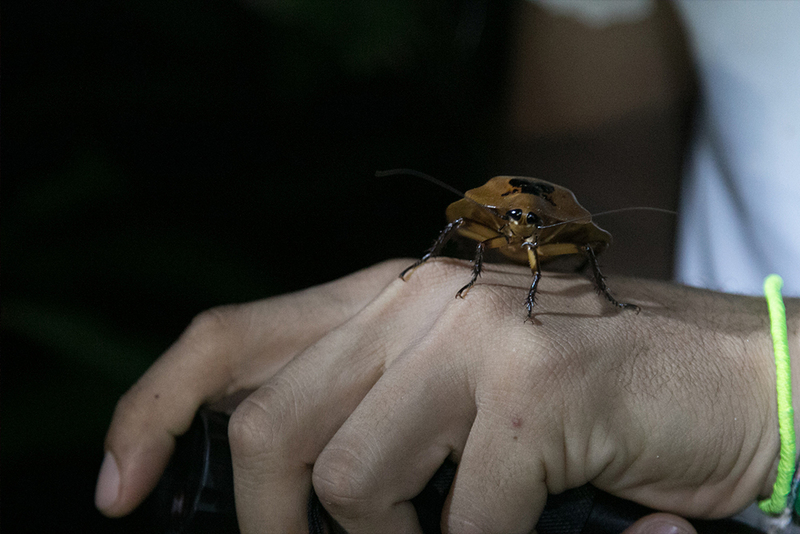 We took flashlights, bug spray, and our cameras in order to obtain footage of the experience. So we began walking, and five minutes later our tour guide, Rigo, stops to dig into a tree’s bark in the search for something. Some of us were just talking, some of us were frightened about the dark, but suddenly, Rigo surprised us by retrieving a huge native cockroach. I was astonished both by the fact that he knew how to find the insect and that he was allowing us to hold it. Afterwards, we headed to a small river, where more creatures of the night made their shelters and crawled as we walked. For instance, we came across a bright red rainforest frog, typically known for its poisonous skin – it oozes out poison if it feels that it is in danger. We saw a lot of spiders, resting beneath the rocks and on top of the rocks we walked on. We had to be careful as we were jumping from rock to rock because not only were the spiders near them, but we also did not want to tread in the river stream. A tarantula we spotted as we were walking through the river’s stream. Other distinct spiders appeared, but these were pretty rare to see along the way. The many talents of our guide Rigo. Soon we were out of the river banks and once more between trees and grasses. It was not long before Rigo led our gaze to a scorpion. However, if we wanted to see the creature in another perspective, we had to turn off our lights. Rigo then pulled out an infrared light and narrated as he grabbed the scorpion near, but not touching, the tip of the tail. Awestruck is the right word to describe this moment. Seeing a scorpion being held safely made me wonder how many other interesting creatures lie in the jungle. 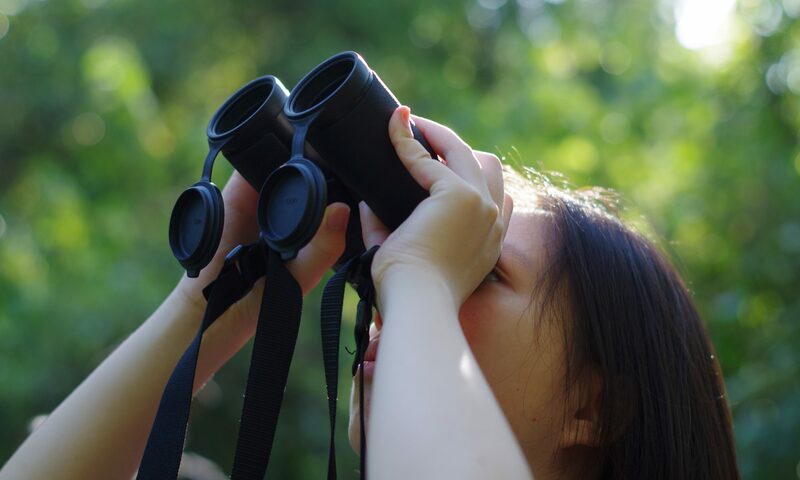 Question by question, picture by picture, our curiosity heightened all the more. All of us were amazed at how Rigo was able to capture and hold the scorpion. Here, displayed under infrared lightning. Our minds were racing with fascination knowing how much knowledge the tour guide has regarding the forest and the animals that it shelters. However, the best part was yet to come. After Rigo let the scorpion go free to where it belongs in the wilderness, he asked us to temporarily turn off the lights. But why would we do that in midst of the darkness that surrounds us? Although it was pitch black, the reason we turned off the lights was because he wanted us to listen to the sounds of the jungle and maintain quiet. In a sense, Rigo wanted us to fully get an idea of how the jungle is every night. Also, this moment gave us the opportunity of seeing how beautiful and amazing nature is for us to enjoy. Not many opportunities like this come along, so it was breathtaking and beautiful to be one with nature in the darkness. After experiencing this wonderful moment, the team and I went back to our main cabin location. Before doing so, we came across another scorpion. Rigo is just so good at finding animals, a unique talent that is useful as a tour guide. This time he allowed us to feel the scorpion walking on us. 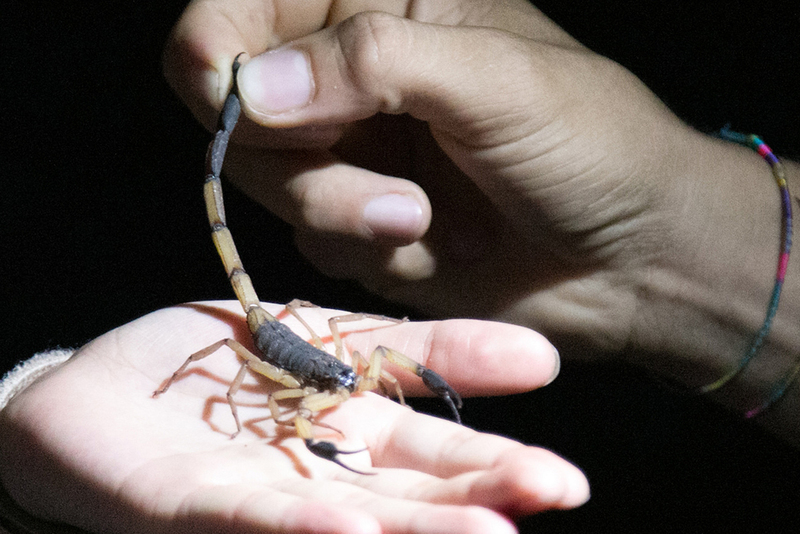 The texture of its feet felt funny and spiky, but it was thrilling to have a scorpion walking on your hand. The author, Erick, and fellow participant Ronalie listen as guide Rigo points out wildlife. Walking back to the campsite, the whole team gathered once again. Relaxing, we held a reflection on our experience of a whole day in the jungle. The fact that we were in the jungle at night time was unforgettable and made us think that nature must be sustained throughout the years to come if others want to experience the same adventure as us. Afterwards, we headed to our cabins in order to catch some sleep. Sleeping at night was kind of hard in the jungle, since insects were able to infiltrate the cabin quite easily. However, it was truly a different experience that not many would want to try. Going into the jungle at night may be frightening and not the best idea, but think of it like this: what if you only have one chance in your life to go through that experience? It is a matter of trying new things and taking risks to live and tell a story. Fortunately, the group and I were able to go through the night jungle and spend our night there in order to understand and feel nature more closely. Go all in, or nothing will happen if you are just there and not attempting something new. Our night in Costa Rica’s jungle taught me this and helped me engage myself in things that I have never done before. Take this into consideration and emerge yourself with nature’s gifts and do something new!